The Screen Actors Guild (SAG) Foundation held a ground breaking for a 4,000 s/f space on the ground floor of 247 West 54th St. that will serve as its screening, performance and educational programming space for the SAG Foundation Actors Center in New York. The facility, a 158-seat theater, will house the final component of the SAG Foundation Actors Center which supports a member base of over 35,000 SAG-AFTRA union performers in the region. A groundbreaking ceremony for the second and final phase of the Actors Center was held at 247 West 54th St. on Tuesday, April 28th and included SAG Foundation executive director Cyd Wilson, SAG-AFTRA national executive director and SAG Foundation board member David White, SAG Foundation treasurer Maureen Donnelly, SAG Foundation board members Rebecca Damon and John McGuire, and SAG-AFTRA New York local president Mike Hodge. Also in attendance at the groundbreaking were the co-presidents of Denham Wolf Real Estate Services Jonathan Denham and Paul Wolf as well as the team they helped select to design the SAG Foundation Actors Center at 54th St. and 8th Ave. Rogers Partners Architects+Urban Designers will conceive its architectural design, with Fisher Dachs Associates as the theatre consultant. Denham Wolf has advised the SAG Foundation in the development of a strategic plan encompassing site identification, negotiation of a long-term lease, design and construction management for the Center. "Since 2010, the SAG Foundation has quadrupled its free, educational programming for SAG-AFTRA New York members. The rate at which New York performers are taking advantage of our professional programs and resources is astounding. This dedicated theater space is our Actors Center of dreams. We're confident that if we build it, they will come," said Wilson. "We look forward to putting the SAG Foundation Actors Center on the map in the center of one of the world's greatest performing arts and broadcasting communities." Procurement of the space marks the second phase of a successful building program that has enabled the SAG Foundation to establish a permanent home in Manhattan for its broad range of free programs. Denham Wolf was first engaged by SAG Foundation in 2008 to lead their real estate planning process. The first phase of the SAG Foundation Actors Center was completed in 2014 and houses a classroom, on-camera lab, computer lab, and the Entertainment Industry Foundation Voiceover Lab located at 1900 Broadway. "The expansion of the SAG Foundation Actors Center in New York has long been in the making and adds to the plethora of programs and resources available to our local members here in the city," said White. "The center's location is extremely convenient for any busy member on-the-go: in the heart of Manhattan near Broadway and not far from SAG-AFTRA's New York office. This center will play an important part for SAG-AFTRA members' career development and education." In 2014, the SAG Foundation served more than 12,000 SAG-AFTRA New York union members with over 500 free classes, workshops and panels. The completed Actors Center will offer an array of inspiring educational programming that will help to shape the careers of union performers in New York and the surrounding communities. "When I joined the Foundation Board, New York members didn't even have one consistent program a month," said Damon, chair of the committee that has overseen the expansion of programming and plans for the new Actors Center. "Our increased programming has been a real game changer, giving members access to casting directors and other industry professionals, including some of the most talented performers working today. Local production continues growing by leaps and bounds, making this the perfect time to break ground on a vibrant new home to serve not only New York members, but any SAG-AFTRA members who come here to work." 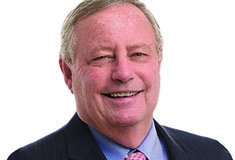 Denham Wolf has continued to work with SAG Foundation as real estate broker and project manager in the acquisition and build-out of the Actors Center. 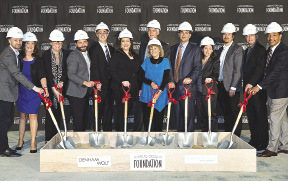 "We helped the SAG Foundation find appropriate space in support of its mission and programming," said Wolf. "The space will optimally meet their needs for flexible, economical, and well-designed space." Amy Lawrence, associate broker, identified the site and negotiated the lease with Boston Properties. Dee Jay Bankhead is the project manager responsible for the oversight of its design and construction, including design team selection. The SAG Foundation screening and performance space marks yet another collaboration between Rogers Partners and Fisher Dachs Associates. The two firms have also completed the Henderson-Hopkins School in Baltimore, MD, and the SandRidge Energy Commons - 120 Kerr in Oklahoma City, OK.
"We are delighted to help the Screen Actors Guild Foundation establish an elegant, iconic presence in New York City with this new state-of-the-art Center," said Robert Rogers, founding partner of Rogers Partners. "May all the stars shine in the Big Apple!" In 2015, the Screen Actors Guild Foundation celebrates 30 years of giving back to the professionals of SAG-AFTRA, their families and communities. The SAG Foundation provides vital assistance and educational programming to the professionals of SAG-AFTRA while serving the public at large through its signature children's literacy programs. Founded in 1985, the SAG Foundation is a national non-profit organization, independent from SAG-AFTRA, and relies solely on support from grants, corporate sponsorships, and individual contributions to maintain its programs. For more information, visit sagfoundation.org. Follow SAG Foundation on Twitter (twitter.com/sagfoundation), Facebook (facebook.com/sagfoundation), YouTube (youtube.com/sagfoundation) and Instagram (instagram.com/sagfoundation). Denham Wolf Real Estate Services, Inc. is a brokerage, consulting, development, and project management firm specializing in real estate services for nonprofit organizations. Since 1998, Denham Wolf has completed hundreds of projects, encompassing the planning, transaction, and building of millions of square feet of space. The experienced Denham Wolf team helps nonprofit clients navigate complex real estate markets and capture development opportunities. Visit Denham Wolf's website to see how the company's services support, protect and bolster organizations. www.denhamwolf.com. Based in New York City, ROGERS PARTNERS Architects+Urban Designers (Rogers Partners) is a comprehensive, cross-disciplinary studio that focuses on the city in all its aspects. Rogers Partners includes architects, urban designers and landscape architects with deep experience in a wide range of city-building commissions. The firm's projects have won more than 60 design and industry awards and have been presented in prestigious exhibitions, including the Museum of Modern Art in New York City. Recently completed and current projects include the redesign of both Constitution Gardens on the National Mall and President's Park South in Washington, D.C.; the Henderson-Hopkins School in Baltimore, MD; Syracuse University's new cogeneration plant, Syracuse, NY; the new headquarters for international advertising firm Droga5, New York, NY; SandRidge Energy corporate campus, Oklahoma City, OK; the Trinity School expansion, New York, NY; and Water Works Park, Minneapolis, MN. projects worldwide. These include important regional repertory theatres like the Guthrie, Shakespeare's Globe, Arena Stage and the Shakespeare Theatre Company in Washington D.C.; multiple venues for performing arts centers, including Lincoln Center for the Performing Arts; and major venues such as Radio City Music Hall in New York and the Hollywood Bowl in Los Angeles, among many others. Shown (from left) are: Kip Katich, Rogers Partners; Cyd Wilson, SAG Foundation; Alissa Bucher, Rogers Partners; Dee Jay Bankhead, Denham Wolf; Peter Rosenbaum, Fisher Dachs; Rebecca Damon, SAG Foundation; Maureen Donnelly, SAG Foundation; Jon Denham, Denham Wolf; Paul Wolf, Denham Wolf; Amy Lawrence, Denham Wolf; Dale Suttle, Rogers Partners; Robert Rogers, Rogers Partners; and David White, SAG-AFTRA.